In stunning watercolor, gouache and pencil illustrations, Tavares conveys the incredible story of the Great Blondin, a tightrope walker who set his sights on crossing Niagara Falls in 1859. Crowds packed the area to see The Great Blondin walk across the falls. Gamblers placed bets on whether he would make it across or "plummet to his death." Not only did he succeed in crossing Niagara Falls, but the Great Blondin also performed stunts and tricks along the way. Young readers will find a lot to like in this narrative, picture book biography. Fold-out pages and illustrations from various points of view capture the dangerous feat. 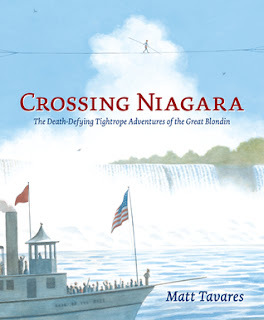 Crossing Niagara would make an entertaining read aloud for story time or an exciting book for a parent to read to a child. Pair Crossing Niagara with Queen of the Falls by Chris Van Allsburg. Visit the author's website to see pages from the book.